This weeks draw was held in Bolands and Tony Gleeson won €616.00. Tony bought his winning envelope in Corrib Oil. Envelopes are available in most business premises and online through www.swinfordgaa.ie where tickets can be purchased in bundles of 10/25/52 weeks. Next draw is in Julians on the 21st February. Draw envelopes are available at 3 for €5. The Michael Walsh leagues will start this Sunday 19th Feb and we have been drawn with Belmullet, The Neale, Castlebar Mitchels B and Balla. 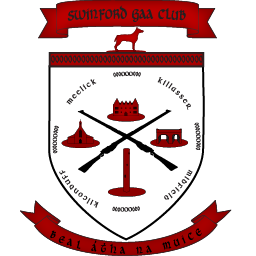 Round 2 26th Feb 12pm Swinford v The Neale This game may be changed to Saturday 25th at 4pm. We are happy to announce that the Under 14 and Under 16 teams from Sean McDermotts Club in Birmingham will be coming to Swinford on the weekend of 31st March/2nd April. This is part of the celebrations of the 60th anniversary of Sean McDermotts GAA. On Saturday 1st April we will be hosting a Under 14 tournament between Swinford, Sean McDermotts, Ballyhaunis and Parke Kilcommin. Following this the Swinford Under 16 team will play Sean McDermotts Under 16’s.